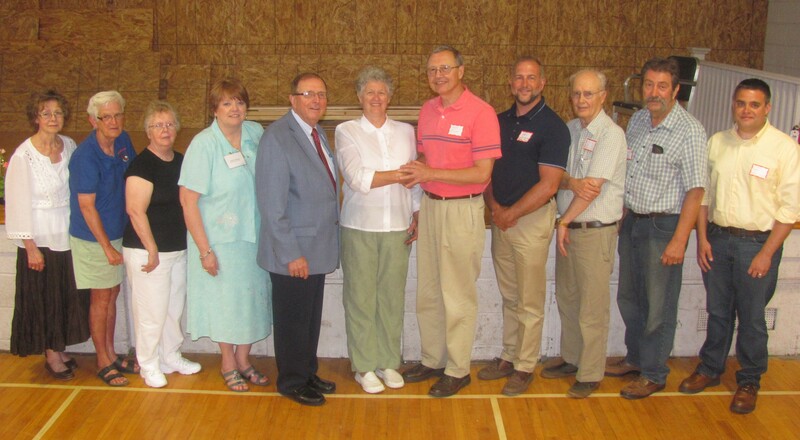 Clifford Township Historical Society associates welcomed board members from Endless Mountain Heritage Region to Susquehanna County on June 18. Among those celebrating the successful partnership between the two agencies were (from left) CTHS members Linda Parlanti, Shirley Granger, and Ruth Knighton; Debra Velunas (representing Rep. Sandra Major); Tom Yoniski (representing Sen. Lisa Baker); CTHS President Sandra Wilmot; EMHR President Frank Oliver; EMHR Executive Director Phil Swank; and EMHR board members Jack Davis, Mike Lovegreen, and Silas Chamberlin. Enthusiastic supporters of the Clifford Township Historical Society (CTHS) greeted board members of Endless Mountains Heritage Region (EMHR) recently and proudly exhibited the fruits of their labors. The preservation and reconstruction of two historic properties in the township were funded in large part through grants facilitated by EMHR. EMHR held its regular board meeting at the Clifford Township Community Building, touring the Historical Society’s growing museum within and the recreational grounds surrounding the former school building prior to enjoying a lunch of local foods served by Linda Parlanti, Ruth Knighton, and Shirley Granger. After lunch, CTHS President Sandra Wilmot led a tour of the former Yarns Cider Mill and a nearby one-room schoolhouse to show the progress of each. The schoolhouse project was much closer to completion, being the first recipient of three grants totaling $29,000. In the course of two additional rounds of grant applications, CTHS also secured $19,000 for the construction of a trailhead area to an old cider mill and the restoration of the contents and of the building itself. Relying almost entirely on volunteers, CTHS is bringing back to life two buildings that seemed to most to be beyond rescue. The memories of people involved in the project, like Sandra’s husband, Mark Wilmot, and other township residents are vital to the historical accuracy and integrity of such restoration efforts. Wilmot worked in the mill as a child some 60 years ago, and John Knighton, who participated in the tour, recalled bringing apples to the mill by horse and wagon with his family each fall. The cider mill was a a thriving business in the community, operating for approximately 70 years, they noted, into the early 1950s. Cider was more commonly consumed than water in the early days of its operation, and the facility became especially popular during the prohibition era of the 1920s and ’30s as cider would eventually “harden” and become a popular alcoholic beverage. The field stone basement walls of the mill had collapsed, and many of the timbers supporting the structure had rotted and given way over the years of the property’s dormancy. “The press was holding this place up,” Mark Wilmot related. The building was jacked up, and workers poured a concrete wall and replaced key wooden beams and wall boards to secure the structure. The largely cast iron press had to be moved out of the way on rollers across an uneven floor that will soon be repoured. Two heavy engines also remain from the original mill. Project volunteers were perplexed at first that such large machinery seemed to have no radiators. As it turned out, pumps brought water directly from the nearby creek to keep the engines cool. Previous to the use of the engines, cider presses at the mill were powered by water wheels moved by channeled streams and a system of stone-walled aqueducts from the surrounding hills, the remains of which can still be seen outside the building. The progress of the cider mill project is ongoing, and Sandra Wilmot, who jokes that she channels her own ambitions through her husband’s capable hands, hopes to have an entryway to the mill reconstructed and a viewing platform ready for visitors to Clifford Township for the community’s Everything Apple Day in the fall. A foot bridge from the parking area to the mill is also in the works. EMHR Executive Director Phil Swank credits preservation-minded people like CTHS directors Patricia Peltz, Fred Lyon, Michelle Jaconia Mclain, and Sandra Wilmot for being able to build such strong support among less than 2,500 residents for projects that might seem beyond the scope of a relatively small community. EMHR board members in general were greatly impressed with both the dedication of CTHS members and their ability to get things done. For more information about heritage projects underway in Clifford Township, readers can log on to www.cliffordpa.com. To learn more about the mission of Endless Mountain Heritage Region and its mission of partnering with communities to support heritage preservation, log on to www.endlessmountainsheritage.org. Mark Wilmot (left) displays one of two engines that once powered Yarns Cider Mill in Clifford Township, Susquehanna County. The Clifford Township Historical Society is restoring the mill with help from volunteers and grants facilitated by Endless Mountains Heritage Region. Clifford Township Historical Society and Endless Mountains Heritage Region board members enjoyed a nutritious lunch comprised primarily of local foods, including garden greens, corn-fed beef, venison and pickled beets at the Clifford Township Community Building on June 18.